Standing in front of the wall of toothpaste, you start to feel sweaty. There are so many choices here! How do you know which one is right for you? As you’re starting to panic, you remember that your dentist had some helpful tips on choosing the right toothpaste for your needs. 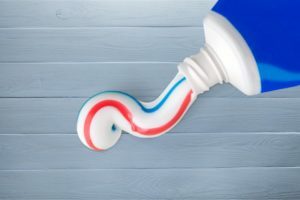 Let’s start with the basics on toothpaste and review the common ingredients you can expect to find in most brands, and what those ingredients do. Detergents: These create foaming action when you brush. Flavoring: Keeps your toothpaste tasting good. You can choose from flavors such as cinnamon, mint, fruits, citrus, and more. Abrasives: These remove plaque and other debris from your teeth. Thickeners: Provide the texture to your toothpaste that you know and love. Humectants: Keep your toothpaste moist so it doesn’t dry out. When you’re choosing toothpaste, the most important ingredient to look for is fluoride. It helps to build developing teeth in children; it can also remineralize enamel that has been damaged by decay. Most toothpaste includes fluoride, but it doesn’t hurt to double check when you’ve narrowed your choices. Choosing the right toothpaste is mostly a matter of personal preference. First, determine the outcome you’d like to achieve. For example, do you struggle with sensitivity? Are you hoping to brighten your smile? Maybe you are prone to developing cavities? Depending on what you’re looking for, you can find different toothpastes such as tartar control to help prevent cavities, or pastes that have extra ingredients for whitening your teeth. There are also brands that are designed to reduce sensitivity. Once you know what you are looing for, you can narrow your choices down further by flavor and consistency. Would you prefer a gel or a paste? Mint or cinnamon? If you find you are still struggling, have your dentist recommend a brand they think would be right for your needs. Your dentist is an excellent resource since they know your history, goals for your teeth, and they monitor your oral health. Now that you know what you’re looking for, you’ll never have to panic in the toothpaste aisle again! Dental Group West in Toledo, OH, is comprised of a highly skilled team of dentists each bringing their own unique skills to our patients, which allows us to offer comprehensive care and advanced services you may not find at other offices. We look forward to building a long-term relationship with you! If you would like to reach Dental Group West, contact us through our website, or by calling 419-469-1485.